Well few days ago one of my fellow blogger, Jolly suggested to start a event based upon alphabet. The idea is basically to prepare a dish whose main ingredient starts with the chosen alphabet. 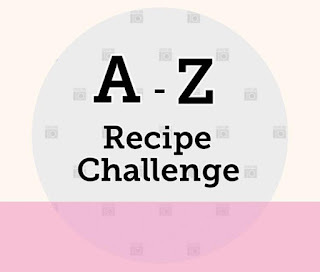 So finally the event 'A to Z Recipe Challenge' is started and this is the first month with the first alphabet A. From childhood, we all have grown with the saying that A for Apple, B for Ball 😉 Jokes apart, for me also always A means A for Apple. So I chose the main ingredient as APPLE. act as a great anti-aging mask etc. So I have come with a very simple dessert using this so nutritious fruit apple as Apple Boondi Halwa. Halwa means a sweet thick Indian dessert basically prepared using milk, ghee and sugar as the main ingredient mostly during festivals. But here I have not used any milk. Simply cook the grated apple in ghee, sugar and some flavor like cinnamon and cardamom and finally I have added some ready-made crumbled boondi ladoo ( round fried gram flour balls like pearls first soaked into sugar syrup, then flavored with edible camphor, cloves and cardamon, finally shaped into balls ). Finally I just sprinkle some chopped almonds while serving, but any dry-fruits of choice can be added while cooking the halwa too. The whole process is so simple yet tastes so delicious and healthy too. And kids will definitely love this lip smacking dessert. 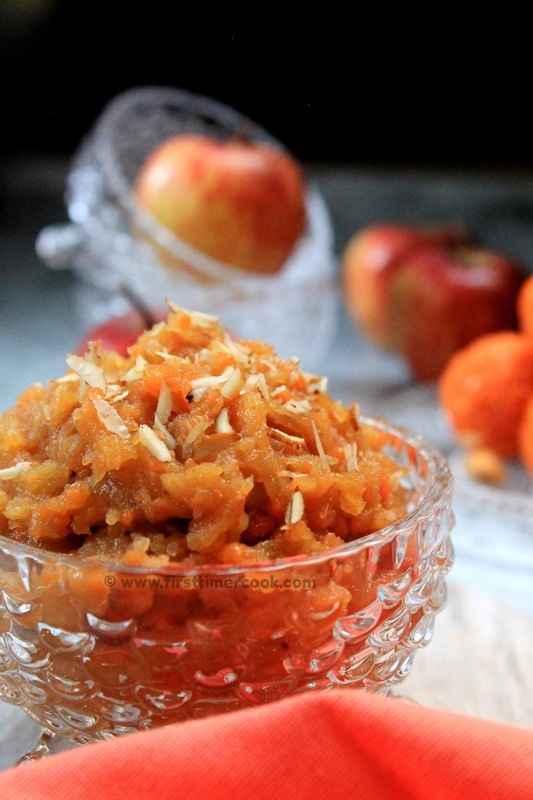 This apple boondi halwa is so perfect dish to prepare during festivals as well as a healthy after-school tiffin ideas for kids. Wash and peel all the apples first. Core, dice each peeled apple and finally grate them. Add in grated apple and fry for 5 minutes stirring in between over medium heat. Now add granulated sugar and mix everything well. Cook again till whole mixture starts to thicken. Add cardamom powder, cinnamon powder and mix again well. Cook for 1 minute more and then turn off heat. Add the crumbled ladoo and mix well again. Transfer to serving bowl, sprinkle some finely chopped almonds and serve warm or cold ! Since the ladoos are ready made hence these are already sweet. So add sugar accordingly. Instead of grated apple, finely chopped apple also can be used. How delighted people will be when they have a spoon of this halwa and then taste all the flavours in there! Wow, extremely delicious halwa, feel like finishing that bowl. Absolutely irresistible. Susmita as I said - Tussi Chaa Gaye dear!What an innovative combo of ingredients! Loved the addition of boondis .. seriously good thought Sasmita. Loved the halwa, looks rich and decadent and will be a hit at dinner parties or festivals too. Great share and glad you are a part. You came up with mind-blowing innovative idea....Halwa looks scrumptious.. Serving apple halwa with boondi is very innovative. Lovely dessert.Something different. Lovely halwa, looks delicious. Thats a good idea to add some boondi into it. Good luck for the A to Z challenge. I will look forward to all your super creative, yumminess overloaded dishes. This one is supremely creative & totally decadent. A nouvelle dish which has already taken my taste buds into a carnival of flavours. Wow!!! This is such a super creative dish,an apt dish to try for this festive season. Innovative recipe .. looks so delicious. one can never imagine using a fruit and sweet together. Wow what a lovely idea to use apples this way. I am sure flavours and texture of the dish must have gone a notch higher. This is such an innovative share Sasmita ! Can imagine how delectable the halwa must have tasted ! Wow dear!! What a great way to use up those extra ladoos which no one wants to eat! 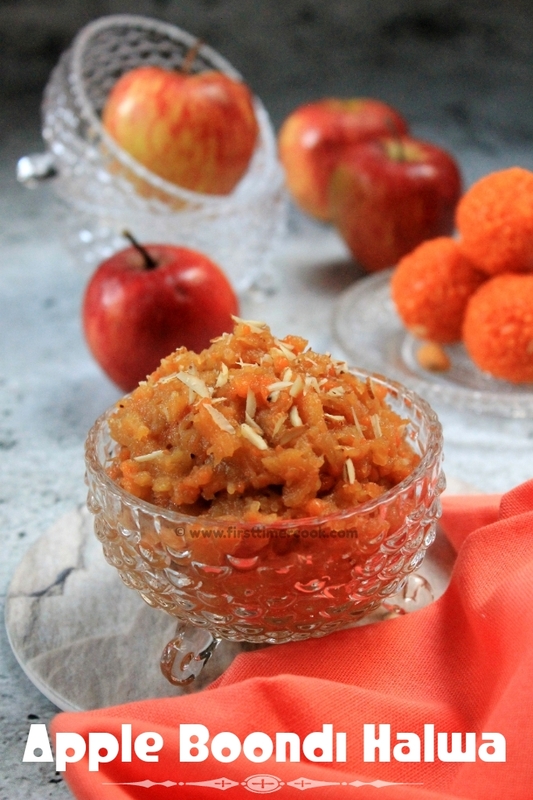 With fall season and lots of apples, a right time to try this; such an innovative dish! Fabulous share dear! 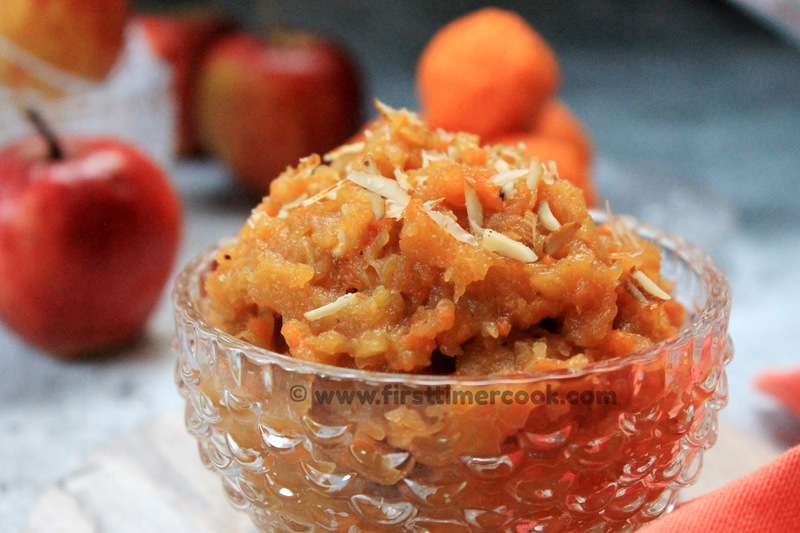 Wow Sasmita, what a lovely twist to the usual apple halwa. I'm really excited to give this a try to know how boondi would taste in this. I'm sure it would be great though. :) Next time when I get boondi ladoos, I will remember to try this. Wow Sasmita!!! This is an amazing halwa. Will taste yummy. Wow, sounds very interesting recipe and the halwa looks so tempting. Lovely colour.